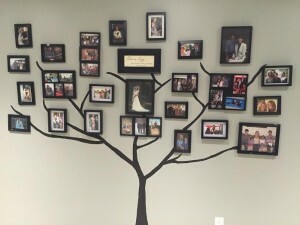 As I make my way downstairs to my office (which is really just my laptop on the coffee table in front of the comfy couch) each night, I stop and smile at the family tree that my daughter created as a surprise last Mother’s Day. I can recall what was happening before and after photo was taken, the circumstances of the special celebrations or the “we just happened to have our camera close by” moments. Each photo is a story! This past week I had the opportunity to visit two very different learning scenes and yet my take-away from both was similar. On Tuesday, I was thrilled to join one of our ESL teachers as she lead a small group session with 5 bright and happy English Language Learners. The lesson was well constructed and transitioned effectively from a minds on activity which activated the students’ prior knowledge about the topic of emotions to a modeled activity which included labeling emotions and finally to an independent task where students were able to identify triggers for their own self-selected emotions and create a booklet. I loved being a part of the discussion and interacting with the students, but it began very evident that as a visitor, my one quick “snapshot” of the group dynamics, the selection of the task and the level of the English language acquisition support needed was not enough to truly understand the learning that had just occurred within that class. Fast forward to the end of the week when I was invited by one of our instructional coaches to observe a conversation with a classroom teacher, as a part of a debriefing session. Observe is a pivotal word, in that try as I might, I couldn’t help but insert a few suggestions throughout the conversation. Having the opportunity to discuss a potential Language lesson wherein the teacher was going to engage her students using articles from an Issues 21 resource, embed some technology and co-construct the success criteria was too good to sit passively and just listen. Throughout the session, I had made some notes to guide my follow-up discussion with the coach. But, once again, it became apparent that without knowing the story of what interactions had been occurring between the teacher and coach throughout the year, my notes were surface observations and not truly representative of any learning. My reflections from my visits this week were a good reminder about the protocols and best practices when we talk about documenting student learning. Unless you know how your selected picture is capturing growth in learning (what the student could do before the picture was taken as compared to the current photo) it’s simply a snapshot with a story.